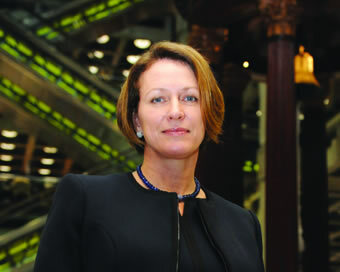 Inga Beale, the CEO of Lloyd’s of London, is number one on the ‘2015 Leading 100 LGBT Executives’ list, created by OUTstanding and the Financial Times . Her appointment in January 2014 made Inga the first female CEO in Lloyd’s 327 year history. She has since spearheaded Inclusion@Lloyd’s, an initiative which aims to ensure Lloyd’s is a diverse and inclusive market. She has also been instrumental in the launch of Pride@Lloyds, an internal LGBT employee resource group, and has supported LGBT insurance employee network LINK. It is the third year that OUTstanding and the Financial Times have joined forces to celebrate LGBT executives. They created three lists in total with The Top 30 Ally Executives 2015 and The Top 30 LGBT Future Leaders 2015 too. The public nominate individuals and the judging panel reviews the submissions and creates the final lists. These lists are important because “LGBT employees who are in the closet are 70% more likely to leave the company within the first three years”, according to the Financial Times in 2014. And “85% of those responding to a survey of OUTstanding’s network of LGBT executives and their Allies said non-inclusive workplaces have a negative impact on employees and can damage productivity”, said the OUTstanding, LGBT Business Barometer, 2014. See the Top 100 in full here.